Blackberries grow naturally in the Southern U.S., so Alabama is a good location for planting blackberries. 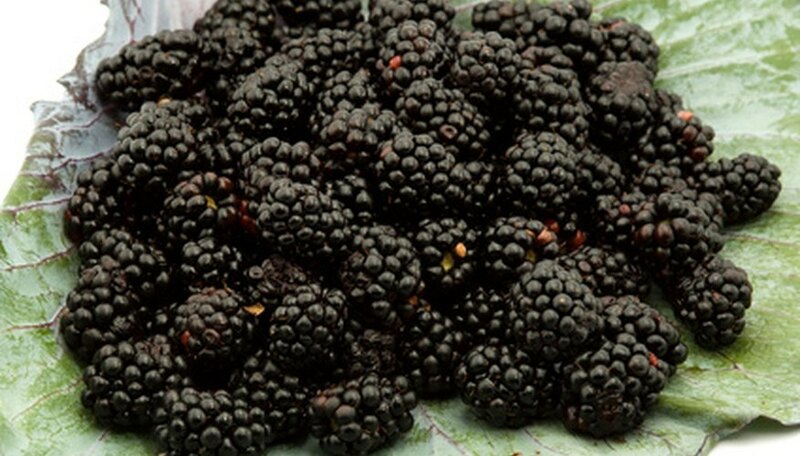 Blackberries are a sweet fruit produced during the summer on thorny vines, often called brambles. There are some improved varieties of blackberries available for planting that do not have as many thorns as some of the old-fashioned varieties and are becoming popular for planting in the landscape. Some standard or old-fashioned varieties to plant in Alabama are Brazos, Cheyenne and Brison. Some thornless blackberry varieties to plant in Alabama are Navaho, Apache and Ouchita. Locate an area in the garden that receives more than six hours of sun each day as blackberries need full sun for optimal production. The area should be well-drained and located near a source of water because blackberries need steady moisture during production, which is from April until mid-July. Plan for each plant to have an area 24 inches by 24 inches to grow. Rows need to be at least 6 feet apart because the trailing thorny vines can overwhelm the planting area over one season, making harvest difficult. Clear the area of all weeds, rocks and other garden debris with a shovel and hoe. Cover the area with 2 inches of well-rotted compost and work the compost into the top 3 inches of soil and rake the area smooth. Plant container grown plants at the same depth they are growing in the container in fall, spring or early summer. New blackberry plants are often sold as root cuttings and should be planted in fall, winter or very early spring. Root cuttings are simply new shoots that were separated from the roots of a mature blackberry plant. They need to be planted lengthwise into the soil at a depth of 3 inches. Plant all plants and root cuttings 2 feet apart. Water new plants or root cuttings and keep the planting area damp, but not wet throughout the growing season.